If you want to make this tag, you will need the freebie cluster frame offered above. I also used a paper from this fun kit, so grab the kit by following the link above also. You will want the SPARKLE MASKS and the GRUNGE masks from Creative Misfits. I used a FTU tube you can find here: http://www.xeracx.net/ but you can use any tube you prefer. The tubes in the Rac store all must be used with a license number ONLY. 1. Open a new canvas. I usually start with 800 x 800 to be on the safe side. Go to LAYER>TRANSPARENCY>COLOR TO ALPHA to make background transparent. 2. Open as new layer the cluster frame. Delete background and credit layers. 3. Open as new layer paper 2 from scrapkit. Right click ADD ALPHA CHANNEL. This is going to be our mask, but we have a couple swteps to do to get it that way. 4. Open grunge mask 5 by Rose and go to COLOR>INVERT and LAYER>TRANSPARENCY>COLOR TO ALPHA. Scale to 650 x 650. Right click ALPHA TO SELECTION. Then up to SELECT>INVERT and click on the paper layer in layers box to make it active & back up to EDIT>CLEAR. Now that your mask is the paper... delete the original mask. Duplicate this paper mask layer so you have a total of 4 layers. Move it into placement. 5. Open as new layer from sparkle masks Mythmask6. Repeat first 3 instructions in step #4. Then go to COLOR>COLORIZE and find a nice cute sandy hue and click ok. Add noise by going to FILTERS>NOISE>RGB NOISE settings at 20/20/20/0 then set this in position, above the mask layer. 6. Open tube of choice. 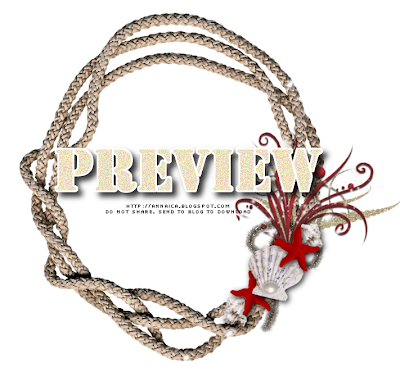 I scaled this one down a bit... Then use the free form select tool to cut out the bottom part. When selected, hit EDIT>CLEAR. Add drop shadow- FILTERS>LIGHT AND SHADOW>DROP SHADOW with settings at 8/8/15 then redo another drop shadow but change the settings to -4/-4/15. 7. Add your copyright info- symbol, artist's name and website, with license number if applicable. 8. I used a font called LMS SHE SHELLS size 60 in black. Add a new transparent layer under this text layer in layers box. Right click on black text layer ALPHA TO SELECTION, then go up to SELECT>GROW by 3. Click on new layer to make active then use bucket fill tool and fill with a sandy hue. Add noise, same like you did in step #5. 9. Add a drop shadow to the sandy shade text layer, settings at 8/8/15 and also add to the cluster frame layer. 10. Use the rectangle select tool to crop your tag. When selected, go to IMAGE>CROP TO SELECTION. 11. Save as a .xcf so you may come back and make alterations if needed. Save as a .png when you're satisfied with your result. Thank you so much for this post. 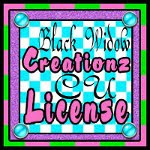 I want to let you know that I posted a link to your blog in CBH Digital Scrapbooking Freebies, under the Page 1 post on Aug. 05, 2011. Thanks again.